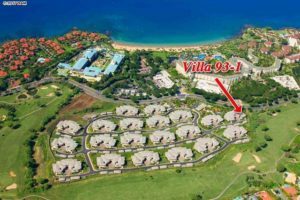 We listed Ho’olei 69-1 in October of last year and didn’t need long before it was able to attract a willing and able buyer. 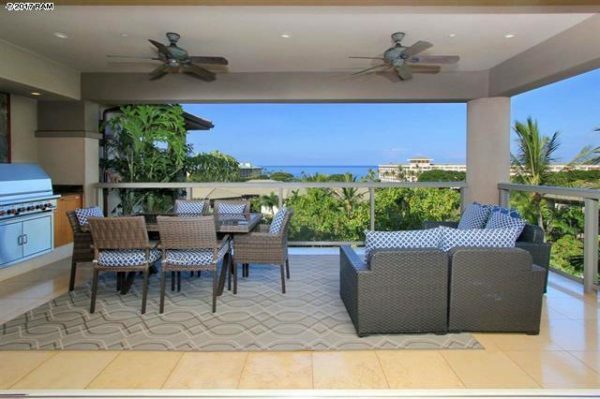 The unit is the largest floor plan of the 3 available at Ho’olei which means it is the most sought after because of the extra room available to accommodate large vacation parties. One of the community’s greatest appeal is the ability to lock and go if utilized as a 2nd home. Although the unit lives like a home, it has all of the perks of condo ownership which means all of the exterior maintenance is handled by the on site staff. The home was offered fully furnished, so what you see is what you get and was in great shape for immediate use as a vacation rental or 2nd home. Listing top row units can be tricky because some buyers will value the ocean views more than the next buyer. Ultimately, we decided to bring the unit to market at $3.25 million. Our sellers stood firm on their price and were eventually able to close for $3,175,000. 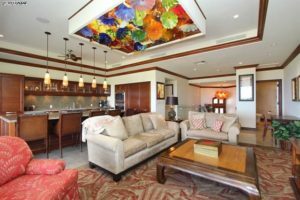 We first brought Ho’olei 31-5 to market in December of last year and immediately stood out as a one of a kind property because of the specially upgraded glass art installed in the unit. 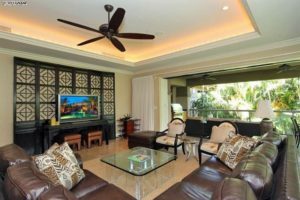 Aside from the ocean view, the living room functions as the hub of the villa where the art piece molded onto to the ceiling is the real focal point. To compliment this stunning art piece, in the entry foyer there is also a custom glass art chandelier that adds a touch of elegance and creates a stunning first impression. 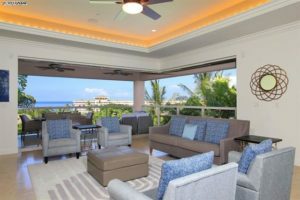 Sitting in the 2nd row of the community, the unit’s lanai is able to offer ocean views similar to some of the upper row villas which made it desirable to buyers in all price points. As a 3 bedroom, 3.5 bathroom, and 2426 sqft unit, the buyers were able to secure the 2nd largest floor plan in the community with the added bonus of two lanais. We first listed the unit at just under $3.3 million where we held the list price firm throughout its entire time on the market. After about 2.5 months on the market, our sellers received an offer they were willing to accept. After a 6 week escrow, we are proud to say we wended up closing for $3.15 million. Last year we took part in 5 of the 7 deals at Ho’olei where our expertise in the community give our clients an inside edge. Being on site everyday, allows us to cross paths with Ho’olei owners, guests, and potential clients who are interested in the complex. We have an exclusive database with only Ho’olei related contacts and are able to call upon it at a moments notice. The sales data is interesting because all price points in Ho’olei were represented. There was sale 1 sale on the low under (under $2.5m), 3 sales in the middle tier (around $2.8m), and on 3 sales on the high end (anything above $3m). With that in mind, buyers can expect ti pay anywhere from as low as as $700/sqft to upwards of $1300/sqft. 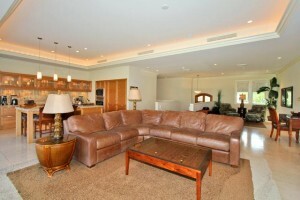 Sellers saw a pretty good deamnd in the market as more than half of the unit sold within 6 months of coming to market. 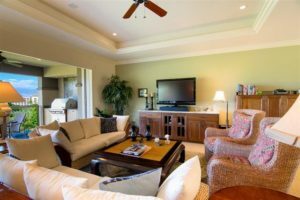 Some Ho’olei units need time to find a buyer because the monthly maintenance fees can get quite steep if the unit not rented out as a short term rental. Ho’olei is currently experiencing low inventory volumes at this time. 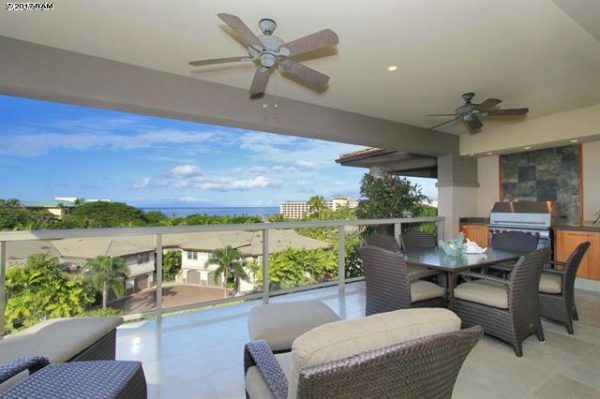 We represent 2 of the 3 current listings and are on site 7 days a week in the Ho’olei real estate information office. 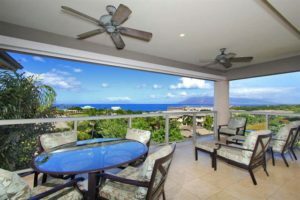 We are experts in the community and continuously in the know of all Wailea real estate happenings. 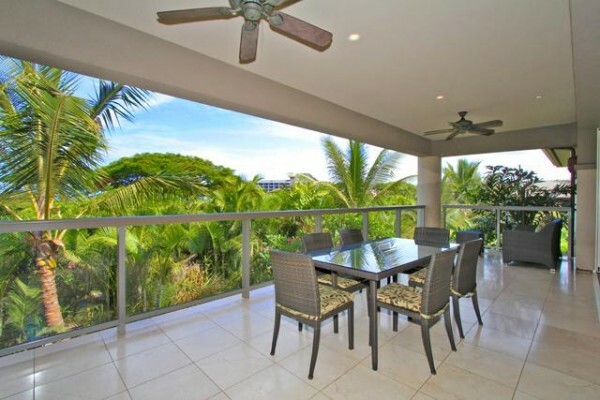 The best way to stay in touch is with our Ho’olei new listing email alerts. 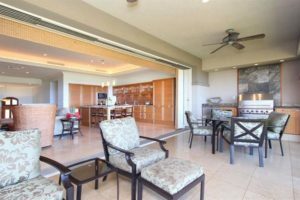 Priced more than $350k less than the next lowest priced listing in the community, Ho’olei villa 24-3 sits on the perimeter of the complex in one of the most private, but convenient location. 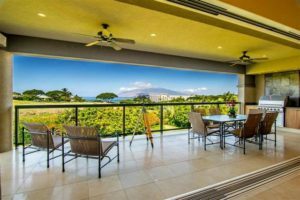 The strong appeal of Ho’olei is the ease of a “lock and go” lifestyle while at the same time enjoy the comforts of a condominium designed to feel like a stand alone residence. Built with a certain level of luxury, interior appointments include a private elevator, a gourmet Studio Snaidero kitchen with Wolf and Sub Zero appliances abundant. The potential rental income and reduced purchase price make this unit a very desirable investment opportunity or a chance to get into the Wailea resort for a cut price. 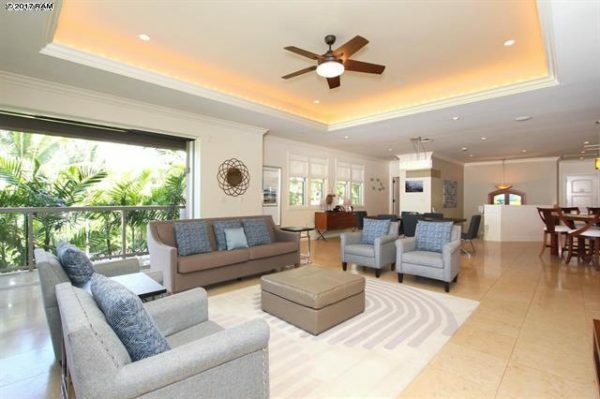 With a list price of $1,900,000, this Ho’olei should be even more of an attractive option to potential buyers. 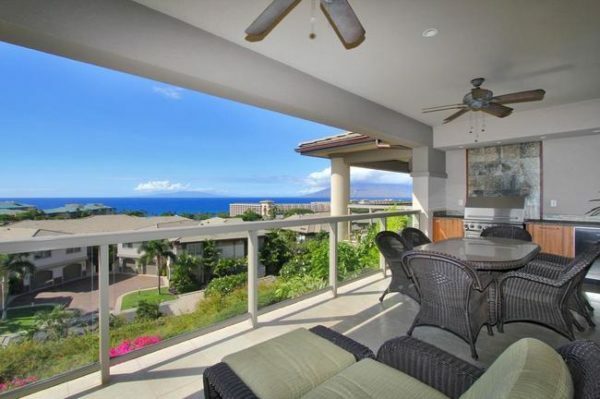 Sit back and relax in this gorgeous Wailea town home. The highly sought after Hibiscus floor plan provides all the comforts of a single-family residence combined with the benefits of condominium living. This villa is both tasteful and comfortable. A stunning carved Mahogany door opens to a wide, grand staircase of honed stone, leading to the great room foyer. Entertain your family in your personal chef’s kitchen including two Sub Zero refrigerators, four freezers, and Wolf stainless steel appliances throughout. Thick dual-paned Fleetwood glass doors magically retract into the wall to reveal and allow access to the 2 covered lanais. This indoor/outdoor living arrangement is an ideal setup to enjoy your meals outside. One of the owners is a licensed Realtor in the state of MA.